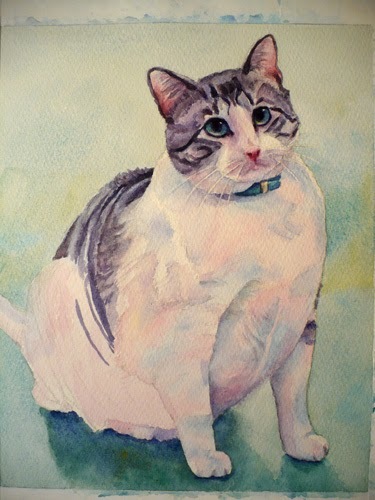 Grits is a great name for a cat, especially one who weighed 22 pounds. I just finished this commission which the client is giving as a Christmas gift to her mom who lost her precious kitty this past year. Hard. But a very thoughtful idea for a gift. Grits was adopted as an adult and was already a huge size. He had blue eyes that were slightly crossed. He was gentle and sweet. His 'mom' adored him. Come along and watch while I paint Grits below. Or skip to the finished piece. 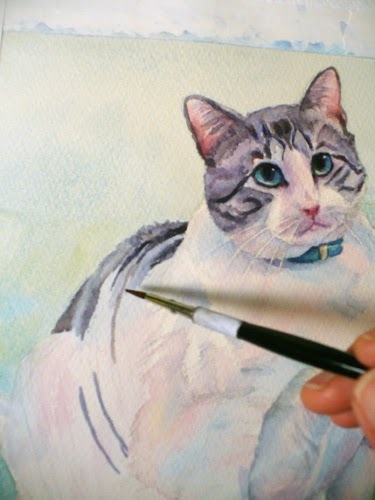 First I draw the cat carefully on regular drawing paper, then transfer the drawing to watercolor paper by tracing it. 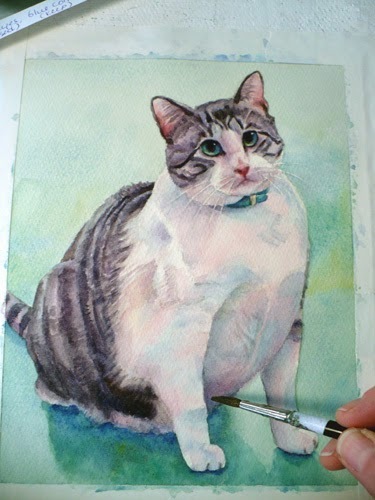 This method avoids erasures on the watercolor paper which would harm the surface and make painting more difficult. Then I paint in a wash of blue-green for the background. This color was requested by the client and it's a good choice as you'll soon see. While I have the blue-green color in my palette, I paint Grit's eyes. They are almost exactly the same shade as the background. I also add some shadows on the ground beneath him. The shadows indicate that the light is coming from above and behind him, so that is where the highlights on his fur will be. 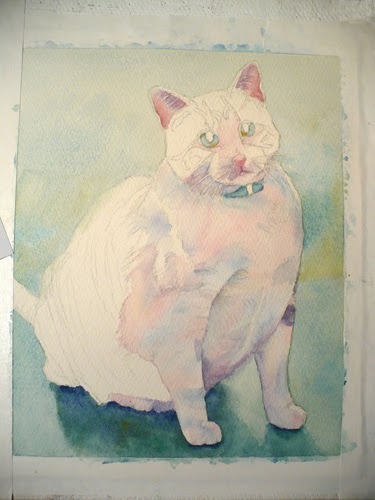 Now I begin to paint his white fur. As you can see, I'm using pinks and blues for the shading. What can I say? I love color! The blue shadows in his fur reflect the background color. His collar is the same color. Didn't I say the client made a good choice for the background? Repetition of color makes a harmonious painting. 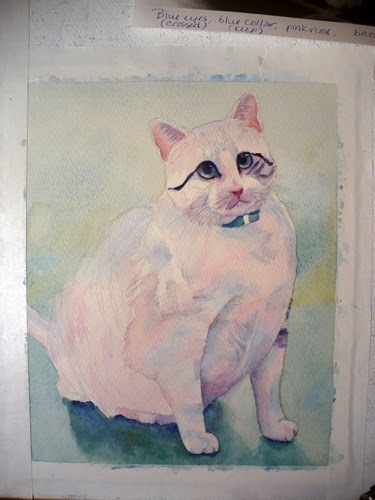 Usually I leave the eyes for last, but I am intrigued by the cat's big crossed eyes, so I paint them in. He looks like he used lots of eyeliner. This looks more cat like! 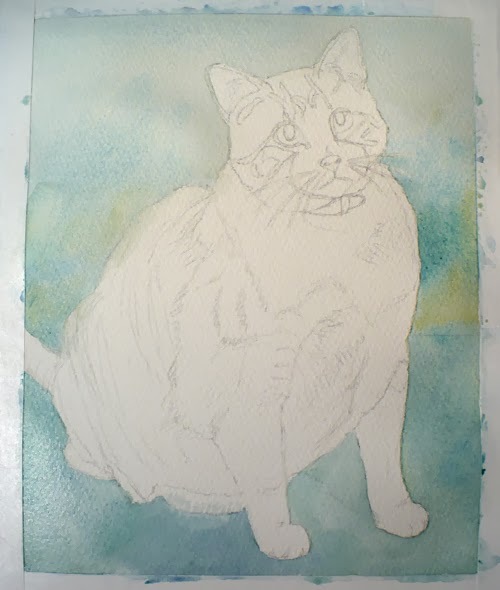 I mix the greys and black for his fur from blue, burnt sienna and rose. I try to shape the planes of his face and body as I paint by adding shading and leaving areas lighter that are hit by the sunlight. 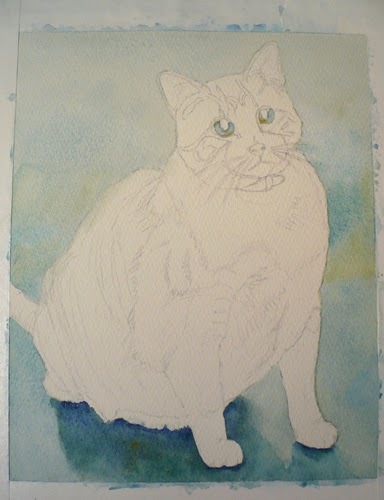 After all his fur and features are painted, I go back to add more shading in the deeper shadow areas. this helps bring out the whiteness of his fur where the light strikes it and gives him a more rounded form so he does not look flat. Below is the finished portrait. You can click any of the images to see them larger. Grits was quite fun to paint. I hope the painting brings comfort and fond memories to his owner. 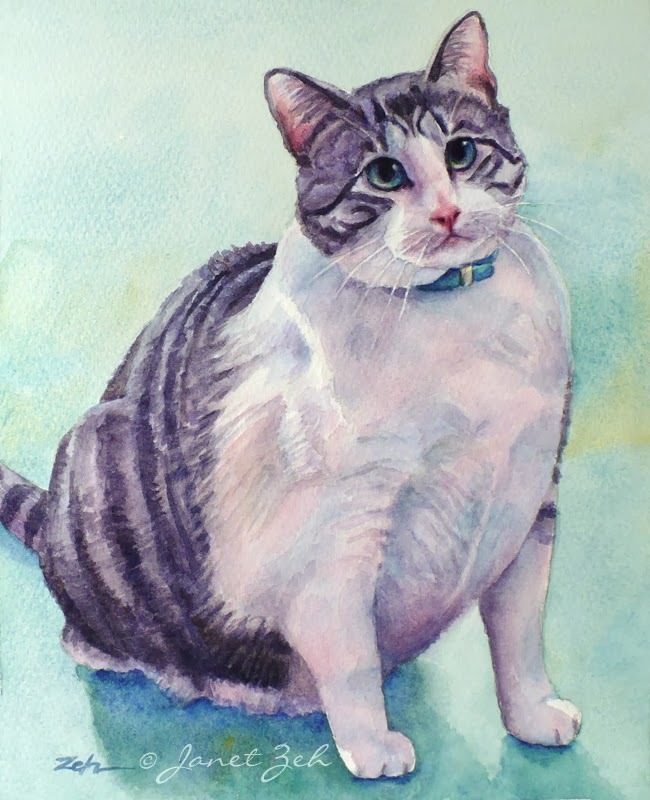 Do you have a precious kitty or dog you'd like painted? Check out the details here, ZehPetPortraits.com or contact me.